Those of you who have been reading for a while will know that teaching kids about money and chores is a huge deal to me. I want my kids to be ready for life when they leave the house and money & chores are a big part of that. Getting into debt is easy. Getting out is excruciatingly painful. Better for kids to learn that lesson on a small scale now than to learn it by taking 10 years to pay off a credit card purchase as young adults. To that end, I’ve let my children borrow occasionally to redeem a reward in our chore system. [As a brief recap of what we do, the kids earn “happy dollars” for chores and use them to pay for screen time and other rewards – the finer details are available here (version 1) and here (version 2).] In order for this lesson to work, I charge interest at the rate of 10% per day. I realize that rate is illegal in most of the world for good reason, but kids need immediate impact. A 5% per year interest rate would be totally meaningless for them. When the kids borrow the “money”, I write the amount owing and the interest cost per day on our white board so it stares them in the face, so to speak. My son absolutely hates having debt on that board. The next day, he gets up early and starts his chores right away. As soon as he’s done enough to get rid of the debt, he wants me to take the payment and erase the debt right away. This practical application has been accompanied by discussion. For example, after the Ontario election a few weeks ago, we were discussing the financial impact of the Liberal victory at the dinner table (no, our conversations are not always this weird). I asked the kids to imagine that they borrowed 500 happy dollars each day for a week. The first day would be no big deal because they could easily complete enough chores to pay off the interest and still have some left over for screen time. But what would happen once they owed $3,500? Their brows furrowed once they realized that they don’t usually earn more than $350 in one day. I explained that the more that you owe, the more you spend your time working for the bank instead of yourself. To give the flip side of the debt analogy, we wanted to illustrate the benefits of interest when it’s working for you. Forgoing immediate gratification is hard. The reward of seeing money grow with interest can help a lot with motivation. In our chore system, we don’t normally use happy dollars for items that cost real money, but we made an exception for this one. If our children saved a total of 5,000 happy dollars between them, we would buy the Lego movie on DVD for a movie night with popcorn. They are each setting aside half of the happy dollars they earn each day to put towards the movie. I’m paying them interest at the rate of 10% per week. They are almost there – and it’s this week’s interest that is going to put them over the top to get the movie. Another great opportunity for discussion! 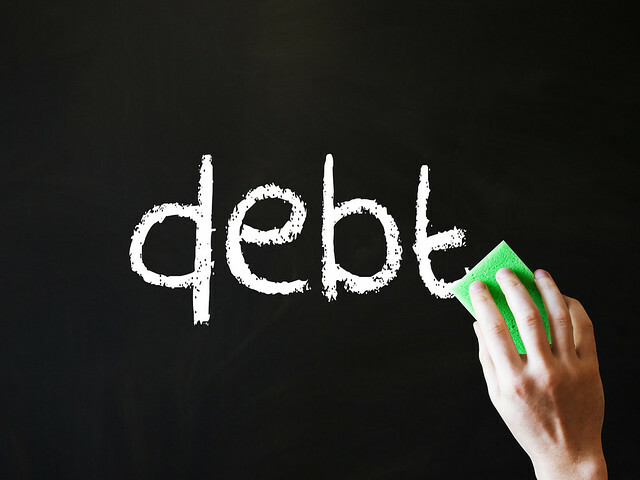 What do you do to teach your kids about debt and savings? 2 responses on "Teaching kids about money, debt, savings, and chores"
That’s fantastic, Missy! So happy to hear that you’re passing on a legacy of good money management to your children – it will literally pay dividends for their entire lives.